The basic Motobu udundi stance is upright with knees straight--a stance called tachū-gwaa.1 The heels are slightly raised with weight resting on the balls of the feet. In attacking and defending, the chest is lifted and movement occurs from the belly, with the feet moving smoothly in any direction. Unlike most current styles of karate, punches are made with the forward arm and kicks with the forward leg. Also different is that kamae is not done with the rear hand in hiki-te, but with the rear hand touching the elbow of the forward arm in a kamae called me-oto-de, or "husband and wife hands." In this respect, it is similar to Choki sensei's Motobu kenpo, both having retained an old-style element peculiar to the Motobu family’s fighting art. Another similarity to Motobu kenpo can be seen in the way attacks are handled; while evading an attack with the body, the counter consists of simultaneous offensive and defensive actions. The Motobu arts do not ascribe to the general principle that “karate begins with a block (uke) and ends with a strike (tsuki).” In addition, Motobu udundi does not apply techniques meant purely for blocking, such as soto-uke, uchi-uke, or gedan-barai. At the foundation of Motobu udundi is mutudi, or motode. Motode is a direct teaching from Choyu sensei, and although it resembles the sanchin kata of Naha-te, differs in breathing, posture, power, and twisting of the hands. In fact, motode is not a kata. Originally, it was a kind of conditioning technique done by advancing and returning to the initial position. It was modified by Uehara sensei into its current kata-like form so as to facilitate group training. There are two forms of motode--one done with fists, the other done with open hands. Both employ the tachū-gwaa stance and upright posture. Breathing is done naturally, without the breath control of sanchin. The hand movements of the open hand version are intimately connected to techniques known as mai no te and their application in tuiti and use of weapons discussed below. Besides motode, Motobu udundi has three kasshin-di, or kassen-te, kata which were also created by Uehara sensei using the waza he was taught by Choyu sensei. Since Motobu udundi had no kata originally, training is centered on sparring called sōtai-dōsa rather than individual kata practice. Choyu sensei taught motode as the foundation and trained in sōtai-dōsa. Similarly, his younger brother Choki sensei taught naihanchi as the foundation and trained in kumite. 1. Tachū means “mountain summit” or “rising to a point” in Ryukyuan dialect. It is derived from a Sanskrit word for a kind of Buddhist temple, but is usually not written with Chinese characters.Gwaa can be a diminutive suffix written with the Chinese character for “small.” In this case, however, it has a purely euphonic function. In addition to the “hard” techniques of strikes and kicks, Motobu udundi has a system of joint locks and throws called tuiti.1　Among the Ryukyuan royalty, use of tuiti was passed down in secret only among the Motobu Udun. The aim of tuiti is to subdue an opponent without causing harm, in the spirit of royal benevolence. Since tuiti was originally transmitted orally only from a master to one of his children, Itosu sensei likely became aware of its existence on his visits to the home of the Motobu Udun to teach karate. According to Seitoku Higa sensei, who had also studied under Itosu sensei’s student Chibana Choshin sensei before studying under Uehara sensei from 1961, Uehara sensei was the only person in the world of post-war Okinawan karate who knew tuiti techniques. Higa sensei himself was on friendly terms with many Okinawan karate masters. A number of characteristics differentiate Okinawan tuiti from aiki jūjutsu. First, the waza of tuiti are generally applied from the palm side of the hand rather than the back of the hand. Second, tuiti waza employ linear movement whereas aiki jūjutsu emphasizes circular motion. There is also no za-waza--aiki-style seated defense--in tuiti. The te-waza in tuiti are believed to arise from applied variations on three hand positions that correspond to those used in the classical Ryukyuan court dances: oshi-te (forward push hands), ogami-te (supplication hands), and koneri­-te (kneading hands). The names of these hand positions appear in the earliest collection of Ryukyuan poetry, Omorosaushi (1531-1623), and they seem to have been gestures used in rituals and ceremony in ancient Okinawa. These gestures are said to have been incorporated into the court dances by Tamagusuku Chokun (born 1684), who was connected to the Motobu Udun. 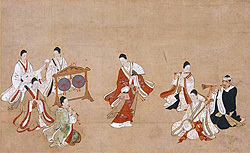 The court dances were known in the past as ukanshin-udui (crown ship dances), and were performed at receptions of Chinese imperial envoys visiting the court for investitures of new kings. At these times, the principle performers were aristocratic males.This was true even for the finest of the court dances--known as "women's dances"--despite their name. These dances were originally entertainment for only the aristocracy, so were almost never seen or learned by commoners or even lower-ranking members of the military class responsible for teaching karate. This would explain why tuiti cannot be found in Okinawan karate. 1. This term is written 取 (tui) + 手 (ti). Choyu sensei also referred to it as "hand-grappling technique." In standard Japanese, the characters are pronounced "torite." It is also sometimes pronounced "tuite"--a mix of Ryukyuan dialect and standard Japanese. 2. To paraphrase the original, “Practice by doing kata over and over and listen to your master to understand the meaning of each movement. From this, determine how these movements would be used in an actual confrontation. There are also special ways to perform irimi (entering an attack), blocking methods, and techniques called tuiti for subduing opponents without causing harm. These do not appear in kata and are only transmitted orally from master to student, thereby keeping them secret." Motobu udundi also makes use of weapons, and following motode, the study of bare-hand techniques and weapon techniques occurs concurrently. Weapons used include bō (staff), jō, uēku (modified oar), and paired tanbō (short bō), nūchiku (nunchaku), tonfa, sai, and kama (sickle). In addition, Motobu udundi uses bladed weapons that lower-ranking members of the military class did not possess, such as the sword, spear, and naginata. This is a significant characteristic of the royal Motobu Udun’s ti. Even after Ryukyu fell to the Satsuma forces in the invasion of 1609, members of the aristocratic udun and tunchi ranks were allowed to possess bladed weapons. In the time of the Ryukyu Kingdom, these ranks numbered about 360 households1, or just under 2% of the approximate 20,000 households of the entire military class. Because of this, only certain families like the Motobu Udun were able to practice ken-jutsu as well as karate. 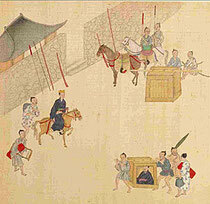 When the head of an udun or tunchi family would go to Shuri Castle, he would be accompanied by a contingent of guards numbering from ten-odd men to tens of men. As described in the 18th-century record called Chūzan denshinroku, this guard was armed with spears and swords. Another feature of Motobu udundi’s weapons system is that the same principles and similar movements are employed no matter what weapon is used. It is not the case that the complexity of the system increases with the number of weapons. Just as with bare-hand training, the heart of weapons training is sōtai-dōsa sparring rather than kata practice. 1. In 1873, there were 28 udun households and 334 tunchi households. Finally, in terms of advanced teachings, Motobu udundi has a “dance” ti called bu no mai, or “martial dance.” Similar to how karate waza are concealed in kata, udundi has advanced techniques like tuiti "hidden" in dance. There is a poem by master Choyu which reads, “Do not take the dancing of the aji at face value, for within are the hidden waza." In this, he expresses the essence of bu no mai. As mentioned above, the court dances of the Ryukyu Kingdom were originally performed at important state events such as royal investitures and could be appreciated only by members of the aristocracy. At that time, aristocratic boys of the udun and tunchi ranks served as pages to the monarchy before their coming of age. Along with scholarship and etiquette, they studied these dances. 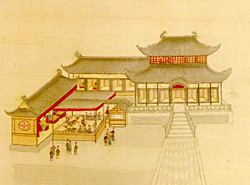 It was from among these boys that particularly gifted individuals were chosen to perform before Chinese imperial envoys. Aristocratic youth in long-sleeved kimono dancing to music. Court dances were also performed for the Shogun on diplomatic visits to Edo. In the same way that the martial arts were compulsory learning for the military class on the Japanese mainland, study of the court dances was compulsory for the aristocracy in the Ryukyu Kingdom. Performed at events of national significance like the reception of Chinese envoys, the dances held a level of importance almost unimaginable today. Accordingly, there was a “minister of dance” (odori-bugyō) who oversaw the dances and who was chosen from among the high-ranking aji and uēkata. The Motobu tradition of tuiti being "hidden" in dance most likely arises from the fact that members of the Motobu family, because of its high status, excelled in both the fighting and performing arts, particularly the court dances. It is this unique situation that led to the commingling of the arts in the Motobu family, so that aspects of each art became utilized in the other: bu within mai and mai within bu. There are also advanced weapons teachings in Motobu udundi called uzumaki (whirlpool) and tatsumaki (tornado) sword waza.